This December, the CEO of the entity created by the $130 billion merger-of-equals last year between the Dow Chemical Co. and E.I. du Pont de Nemours & Co. will receive the Leadership Award for Historic Corporate Reinvention, given by the Chemical Marketing and Economics group of the American Chemical Society’s New York Section. Breen is being honored for his “exceptional leadership” in navigating “the complex commercial, financial and global regulatory hurdles to make a reality the largest merger in the history of the chemical industry, and the fourth biggest of all time,” according to the business group. The combined company, which will create three independent units in agriculture, materials science and specialty products, is now “profoundly changing a number of industry segments,” the group said. Prior to his role at DowDuPont, Breen was the chair of the board and CEO of DuPont, a role which he assumed in November 2015, after joining the board of directors in February 2015 and being named interim chair of the board and CEO in October. 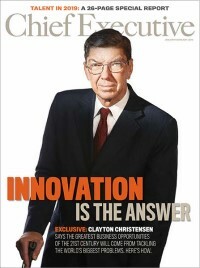 Breen served as chairman and CEO of Tyco International plc from July 2002 until September 2012, overseeing the company’s restructuring, including divesting non-core operations resulting in the spin-offs of Covidien, TE Connectivity, ADT Corp. and the merger of Tyco Flow Control with Pentair. after it separates from the company, along with the separation of the agriculture division (Corteva Agriscience), both expected to occur by June 1, 2019. Marc Doyle, currently chief operating officer of the specialty products division, will become CEO of DuPont, and James C. Collins, Jr., currently chief operating officer of the agriculture division, will be CEO of Corteva Agriscience. Breen has been awarded numerous governance awards including being named one of the “100 Most Influential People in Business Ethics” by Ethisphere. He’s No. 115 on Chief Executive and RHR International’s CEO1000 Tracker, a ranking of the top 1,000 public/private companies.